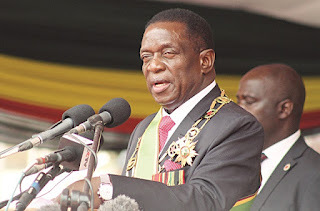 PRESIDENT Emmerson Mnangagwa yesterday reportedly chickened out of a church-organised presidential candidates’ indaba, which could have brought him within spitting distance of his closest challenger MDC Alliance presidential candidate Nelson Chamisa ahead of the month-end polls. The high-profile meeting had been organised by the Catholic Church-run Silveira House to enable the 23 presidential contestants in this year’s elections to interact as part of efforts to foster multi-party democracy in the country. Both protagonists had, according to the organisers, initially confirmed attendance to the interface in Harare before making an 11th hour volte face citing “pressing commitments”. The meeting eventually attracted a handful of presidential aspirants, among them People’s Rainbow Coalition candidate Joice Mujuru who left in a huff and without speaking, Coalition of Democrats’ Elton Mangoma, Nkosana Moyo of the Alliance for People’s Agenda and MDC-T vice-president Obert Gutu. Mnangagwa’s spokesperson George Charamba yesterday seemed to confirm reports that the Zanu PF leader absconded the gathering to avoid being waylaid into a presidential debate with his rivals. “We very much support the peace efforts (by the church). In fact, that’s their raison d’etre. (But) where you have them seeking to introduce a presidential debate, then that is beyond the Bible. In our communications strategy, we do not have room for that,” Charamba said. Spokesperson of the organisers Father Arnold Moyo, without singling out individuals, said candidates who absented themselves gave last-minute excuses. Both Mnangagwa and Chamisa had campaign rallies in Kadoma and Kariba, respectively. “We sent invitations to all candidates, many of them confirmed but some for various reasons could not come. Some of the reasons highlighted include ‘commitments’ but we are grateful to those who could attend in as far as instilling a sense of multi-party democracy and mutual respect is concerned,” Moyo said. But insiders within the Catholic Church said Mnangagwa had told emissaries that he would not attend if Chamisa was part of the gathering. “Mnangagwa indicated he would not attend if Chamisa was part of the programme. If anything, he was one of a few who never really gave their word that they would come to the event,” NewsDay heard. Chamisa, who in March this year challenged Mnangagwa for a public television debate ahead of the polls, yesterday said he would have attended had he been formally invited to the meeting . “No. He was not invited in any formal way. He would certainly have made arrangements. I fear that their invitation may have been lost in the system. It did not reach me,” said Chamisa’s spokesperson Nkululeko Sibanda. But event organisers insisted that the youthful opposition leader had confirmed, but made a last-minute cancellation on Wednesday night, citing pressing commitments. “Chamisa confirmed he was coming. He was aware of his rallies and this excuse is only a mirage. The reasons run deeper than this narrative we are being fed,” said a top Catholic priest who declined to be named. He added that as a citizen he was happy with the election preparations so far, adding there was still room for the few sticking points to be resolved through dialogue before the polls. Zimbabweans troop to the polls on July 30, the first without the country’s founding leader Robert Mugabe who stepped down under pressure from the military, Parliament and ordinary citizens last November. Chamisa has, however, already raised a red flag, accusing the Zimbabwe Electoral Commission (Zec) of creating conditions that seem to favour Mnangagwa and his Zanu PF party. Mnangagwa has rejected the claims that he was being favoured and challenged his foes to seek recourse at the courts of law, insisting that elections would proceed as scheduled. Chamisa yesterday told his supporters in Kariba that there was no going back on their planned five-day sit-in at the Zec offices. “Tomorrow (today) we are going to meet (former UN secretary-general and Elders’ Council chair) Kofi Annan and if we fail to agree (with Zec) next week we are going to shut down Harare. I’m going to call everyone in Harare and show them. This time they will not cheat. I know that President Emmerson Mnangagwa is working with Chigumba to rig these elections, but this time they will not succeed,” he said. Mnangagwa on the other hand, told his Zanu PF supporters in Kadoma that Zec and Chigumba were discharging their duties independent of government. Mnangagwa, however, acknowledged that many Zanu PF candidates in the July 30 elections made it through rigging and vote buying. “In our party we said no more impositions, be it councillors, Members of Parliament or even senators, no more impositions at all. The power comes from the people, all of us are here because of the power that we are given by the people. Anyone who wants to be a leader in the party should know that they are a servant to the people,” he said.